Yesterday was the fifth and final day of Paw5's Enriched Life Challenge! Paw5 has challenged dog owners to make their pets' lives even better, through several different types of enrichment. We've spent the last five days taking trips, visiting friends, and trying new toys and games. I have included my cats in the challenge because I think indoor cats could really use some thoughtful enrichment activities. Yesterday was super busy, as I spent the day helping set up for a herding trial, but we still managed to fit in some enrichment. 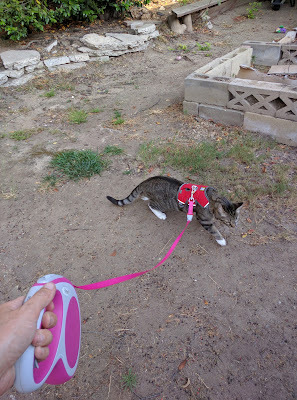 I took James and Solstice out to explore the yard on a harness and leash. 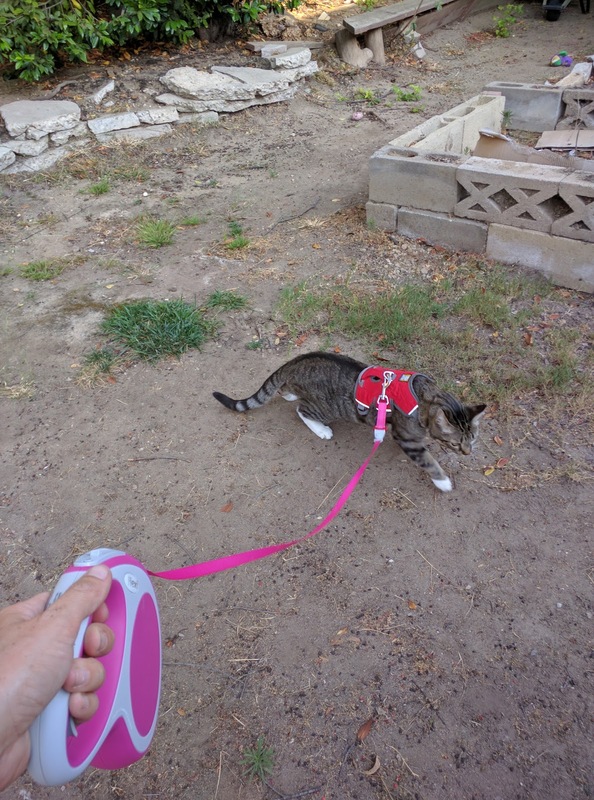 I found that an XXS Ruffwear Webmaster harness works very nicely for my cats. Taking indoor cats outside requires some planning and foresight, they don't tend to want to follow you like dogs. Getting outside to nibble the grass and explore the yard provides the Hellions with a ton of sensory and environmental enrichment. Ru stayed home with my mother while I was out setting up for the trial. She has music students on Fridays, so he got to listen to some piano and clarinet duets. Fridays at home provide some sensory and social enrichment for Ru. Godzilla and Zip went with me to set up for the herding trial. They got to run around and explore at the park, and see lots of our good dog and human friends. Zip even got to see three of her litter sisters! They also got to watch the geese that will be herded in the trial. There were fifty of them. That's a lot of geese! It was a day filled with sensory, social, and environmental enrichment for the girls. The dogs and I have had a lot of fun with the Paw5 Enriched Life Challenge. It has inspired me to think more about enrichment for Ru and the cats, and made me appreciate how much Godzilla and Zip get out of our daily routines. We still haven't tried DogTV yet though, I will have to report back when we have the chance.